I’m just back from France, where I mixed a little business and pleasure. Well, for me France is always a pleasure. One thing that struck me is that for all the talk of Ireland being expensive, I think it’s a bargain compared to France. Hotels, meals, ice cream – everything cost more, especially on the higher end. 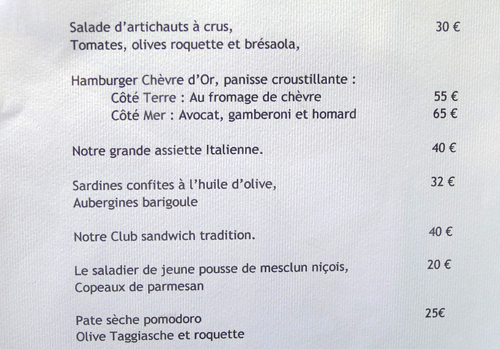 For example here’s a lunch menu from Le Château de La Chèvre d’Or in Eze, France. 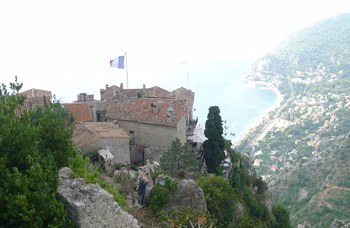 Eze is a beautiful town, perched on top of a hill that overlooks the sea, and no doubt the Château is a great place, but for those of you who might be wondering, no I didn’t order the €65 burger with avocado, prawns, and lobster. In fact, I didn’t even go inside. My tastes were running on the simpler side that brunch time. 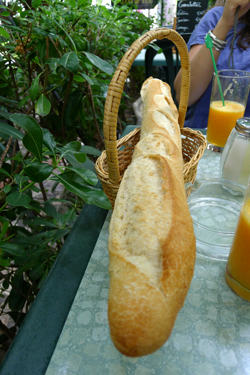 As always, for all of the gourmet experience to be had in France (and I had some great meals), the things that make me the happiest are often the simplest things – a great loaf, an amazing piece of cheese, a surprising chocolate truffle or ice cream flavour, a delicious glass of wine.